You did like it!? I watched the award show last night and so wanted George Clooney and The Descendents to get it. 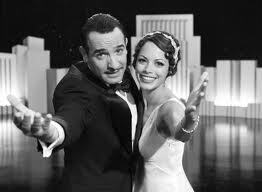 I don't really care for silent films so I just could not figure if I would enjoy The Artist. It sure did get the awards though. I really did like this movie. It's fun and celebrates the art of movie making, which I just loved. Now...that doesn't mean I'm wanting a steady stream of silent B/W films. This movie was making a point that was enhanced by these techniques. If someone else tries it, it will likely fall flat as it really is a one trick pony. I thought The Descendants was well done as well, although a really tough subject matter that left me filling really down afterwards. And I don't know if I ever really bought George as this dorky out of touch husband. The oldest daughter was amazing. If anyone should have been nominated...it should have been her. There might be a job waiting for you in Hollywood....Oscar Winning Movie Picker! Of all those nominated, I only saw Moneyball.